Saturday, November 10th turned out to be a beautiful day!!! The weather was perfect and the Adams Wedding went perfectly!!! I cannot wait to see the professional pictures. The wedding started at noon at the Naval Chapel and continued to Loews for the reception. The decor for the reception really complimented the bride and groom’s fall wedding. Each table has white linens, red chargers, the flowers in the middle of the table by Little House of Flowers were awesome. The cylinders were lit up at the bottom, filled with red flowers, topped with white floating candles, the head table had all the bouquets and they really accented the table. The cake table became part of the decor as well, Select Confections prepared a gorgeuos square tiered with edible fall colored leaves trickling down the entire cake and onto the table, beside it was the groom’s submarine cake. Everything was perfect!!!! Vendors: Behind the Veil, Photography by Alexander, Little House of Flowers, Naval Academy Chapel, Select Confections, Towne and Transport, Dave Tieff DJ, Loews, and the rehearsal at O’Briens (they were great!). 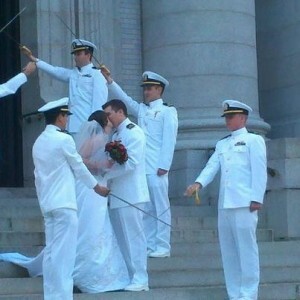 Can’t wait for my next Naval Academy Wedding.